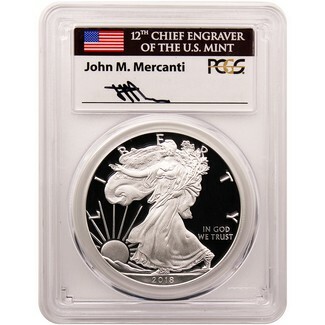 A TV Exclusive for The Coin Vault, with a maximum PCGS population of just 800 coins! This is the 2018 W Proof Silver Eagle, certified by PCGS in perfect PR70 condition. With First Day of Issue notation, the '1 of 800' Flag Label has been hand-signed by John Mercanti, 12th Chief Engraver of the U.S. Mint. These were signed before his exclusivity agreement with NGC, making this a rare option for PCGS certified coins.